Cone (2005). I base my interpretation of sikussaq on the descriptions of Koch (1926). Cone, M. (2005). Silent Snow: The Slow Poisoning of the Arctic. Grove/Atlantic Press, New York, 256 pp. Emerson, R.W. (1898). Poems. New and Revised Edition. The Riverside Press, Cambridge, MA. Helprin, M. (1983). Winter's Tale. Harcourt Books, Orlando, FL, 672 pp. Koch, L. (1926). Ice cap and sea ice in North Greenland. Geographical Review, 16 (1), 98-107. Snow cover statistics are from the Rutgers University Global Snow Lab (see chapter 1). 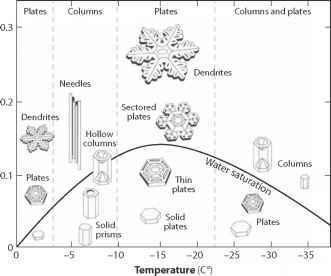 The physics of snow and ice melt are discussed in chapter 3, with simplifications to the energy balance that are commonly used to model snow melt discussed in Hock (1999) and Ohmura (2001). Herron and Woo (1994) examine some features specific to lake ice decay (see chapter 3). Hock, R. (1999). A distributed temperature-index ice- and snowmelt model including potential direct solar radiation. Journal of Glaciology, 45 (149), 101-111. Ohmura, A. (2001). Physical basis for the temperature/melt-index method. Journal of Applied Meteorology, 40, 753-761. World Meteorological Organization (2008). Guide to Meteorological Instruments and Methods of Observation, Appendix 4B. WMO-No. 8 (CIMO Guide). World Meteorological Organization, Geneva, Switzerland. Adams, W.P. (1981). Snow and ice on lakes. In: Handbook of Snow (D.M. Gray and D.H. Male, eds.). Pergamon Press, Toronto, Canada, pp. 437-474. Ashton, G.D. (1978). River ice. Annual Review of Fluid Mechanics, 10, 369-392. Duguay, C.R., G.M. Flato, M.O. Jeffries, P. Menard, K. Morris, and W.R. Rouse (2003). Ice-cover variability on shallow lakes at high latitudes: Model simulations and observations. Hydrological Processes, 17, 3465-3483. Martin, S. (1981). Frazil ice in rivers and oceans. Annual Review of Fluid Mechanics, 13, 379-397. Prowse, T.P. (1995). River ice processes. In: River Ice Jams (S. Beltaos, ed.). Water Resources Publications, LLC, Highlands Ranch, CO, pp. 29-70. Meteorological data for Yellowknife and Eureka, northern Canada, are from Environment Canada (http:// www.climate.weatheroffice.gc.ca/climateData/canada_e .html). Estimates of the load capacity of lake ice are synthesized from various (sometimes conflicting) sources, including A Field Guide to Ice Construction Safety (2007), published by the Northwest Territories Department of Transportation (http://www.dot.gov.nt.ca), the State of Minnesota Department of natural Resources (http:// www.dnr.state.mn.us/safety/ice/thickness.html), and the Finnish Road Administration.